Within the Hindu Shaivite and Shakta Tantra traditions a deity may be worshipped in three ways - as a figurative statue or painting, as an abstract image or symbol, and as a yantra or 'device'. A yantra is like a mandala in its two-dimensional geometrical form, but it is often drawn or inscribed on birch-bark or copper plate with a metal stylus. Some yantras, such as the Shri Yantra, may also be three-dimensionally sculpted from minerals such as rock crystal or lapis lazuli. The Shri Yantra, or Shri Chakra, the most well known of all yantras, represents the auspicious goddess Shri Lakshmi in her enchanting aspect as Tripura Sundari, the 'beautiful lady of the three cities'. Tripura Sundari, who is also known as Sodasi, is one of the ten Mahavidya goddesses. She is red in colour, beautiful and youthful like a sixteen-year-old (sodasi), and she holds the subjugating attributes of a flower bow and arrow, a hook and a noose in her four hands. 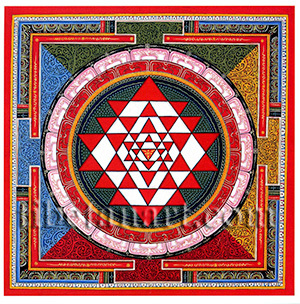 The Shri Yantra is formed from nine triangles that interlock around a central point or bindu, with the bindu representing the goddess herself. Four of these triangles point upward, representing the male aspect of Shiva; and five point downward, representing the female aspect of Shakti. Collectively these nine intersecting triangles are known as the navayoni, or 'nine wombs', which creates a configuration of forty-three red triangles upon a white background. These triangles are arranged in a series of five chakras or wheels, which progressively contain one, eight, ten, ten and fourteen triangles from the centre outwards. The navayoni-chakra rests upon the green seed-head of a double-lotus with sixteen red petals, sixteen white petals, and an outer black protective ring. Outside of the lotus wheels is the yantra's square bhupura or 'earth-city', which has four directionally coloured inner quadrants and four outer gateways.